Looks like a watch, acts like a smartwatch. 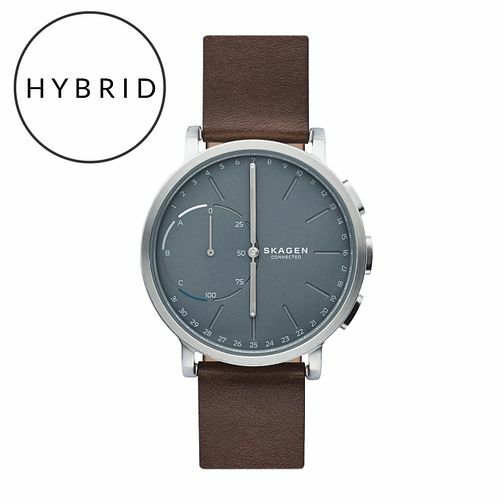 The Hagen Connected Hybrid Smartwatch by Skagen. Combining innovative technology with classic design. Featuring Skagen Link, which allows the wearer to snap a photo, control their musci and more - all with a push of a button. Hagen Connected is compatible with Andoid Phones and iPhone, and syncs wirelessly to the Skagen App, where you can view your data and manage your settings. The watch runs on a standard coin-cell battery with a four to six months battery life that is easily replaceable by the user, so it never needs to be recharged. Changeable straps with quick-release-pin construction makes it easy to interchange steel, leather and silicone straps.